Prof Lateef Sanni, President ISTRC-AB. 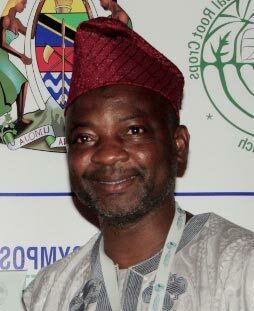 Prof Sanni, who is the Dean, College of Food Science and Human Ecology at the Federal University of Agriculture, Abeokuta, Nigeria, will be assisted by Dr Kiddo Mtunda, a principal researcher at Tanzania’s Ministry of Agriculture, Livestock and Fisheries and the chair of the Local Organizing Committee of the 13th Symposium. Mtunda was elected as the Vice President as stipulated by the Society’s constitution. Other officials who retained their seats were the current secretary Dr Pheneas Ntawuruhunga, a cassava breeder from IITA-Zambia; and the Treasurer, Dr Elizabeth Parkes and Editor-in-chief, Dr Richard Okechukwu, both from IITA Ibadan. The Assistant Secretary, Dr Simon Eze from the University of Nigeria and the Associate Editor, Dr Godwin Asumugha from the National Root Crops Research Institute, Umudike, Nigeria were also reelected. Dr Nzola Mahungu from IITA-DRC and Drs Robert Asiedu, Chief Alfred Dixon, and Peter Kulakow, all from IITA-Ibadan kept their positions as Ex-officio members. Dr Bosola Oladeinde from the Cassava Adding Value for Africa (C:AVA) project joined the committee as Fundraising Officer while Kanayo Chukwuka, Kwame Ogero, Moita Nassy Laurentine Marielle, and Vito Sandifolo, were elected as representatives for Western, Eastern, Central, and Southern Africa regions, respectively. The elections took place during the organization’s business meeting.